Because of their transparency most small aquatic organisms will give you a magnificent view of many biological processes. Within water-fleas all the stages of the development of the young can be witnessed. In the center of this image we see the long ovary and on the right embryos are developing, already showing red eyespots. Water fleas don't need a partner to reproduce. By so called parthenogenesis, females can grow enormous amounts of offspring from unfertilized eggs. Male water-fleas only develop when the conditions are getting worse. 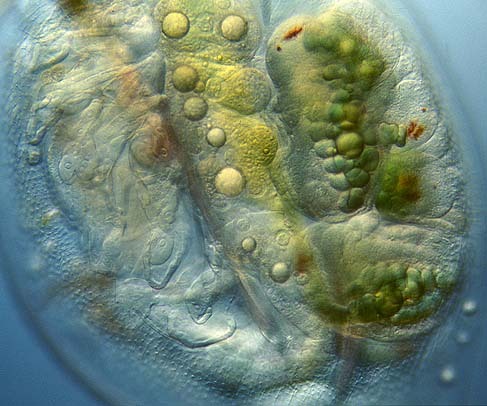 Fertilized so-called winter-eggs are formed to survive cold but also dry seasons. This image also shows the skin texture and the gills on the legs. All comments to the author Wim van Egmond are welcomed.